The Acumar Single Digital Inclinometer is a compact, handheld unit that features a large digital display for easy reading. Store measurements with the hold button, as well as review maximum, minimum, and average values. This full featured unit reduces examination time and enhances the objectivity of measurement and documentation. Supports range of motion evaluation as described in the AMA Guides to the Evaluation of Permanent Impairment. Inclinometer comes with built-in wireless transmitter to optional computer interface. 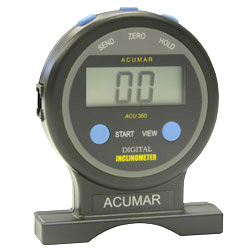 The Acumar Digital Inclinometer is the world's first digital inclinometer that offers easy to use wireless data. The Acumar Digital Inclinometer Suite provides accuracy, repeatability and objective documentation of range of motion measurements. A few of the benefits resulting from choosing our product for your inclinometer needs. Measurement storage frees user from having to record measurements between readings. Optional wireless transmission eliminates transcribing errors and saves considerable time. Examiner is freed up to devote attention to the examination procedure resulting in a more accurate assessment in less time. Digital Inclinometer may be attached to the ruler. Optional infrared wireless computer interface simplifies data transfer from inclinometer to a computer. This product allows you upgrade your Acumar Single Inclinometer to a Acumar Dual Inclinometer. Package contains Companion Unit and Connecting Cable.